A guy who makes you cry, a man who takes your breath away and turns your stomach upside down. Why do we like bad guys so much? Chloropicrin had a brilliantly lethal debut as a warfare agent in WWI. But that was not enough for him, he evolved and trained to reappear as a prolific soil fumigant for crops such as strawberries, peppers, onions, tobacco and tomatoes. Who cares if he causes fields to be infertile? He will give you the best season of your life! A method actor, his performances sink in – through inhalation, ingestion and dermal exposure. His power of seduction will reach you just by getting close to one of his fields. Of course, he is highly volatile and unpredictable, as several massive community poisonings have demonstrated, but it is a small price to pay when you are working with such a sensitive actor! We are glad that he didn’t give up after being awarded with a “Toxic Air Contaminant” by California in 2011 for being as carcinogenic as diesel exhaust. 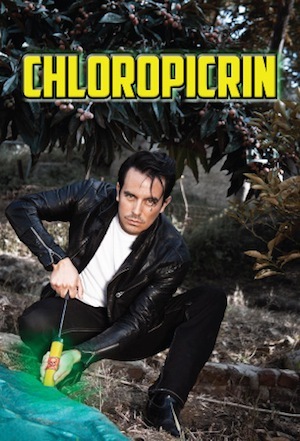 Even as younger non-chemical fumigants fight for a piece of stardom, Chloropicrin stands solid because his bad boy charm keeps him in the headline. Who wants a nice guy when you can get the one who makes you cry? He’s been making people cry and gasp for breathe since the early 1900s. His first debut was in WWI, when he was used as a chemical warfare agent by the Germans, penetrating their skins, inducing vomiting, and forcing soldiers to remove their gas masks. and nursery crops, but leaves a trail of tears behind him wherever he goes. First patented as a pesticide in 1908, his next employment put his killer skills to work in the agricultural sector. Chloropicrin is used primarily as a soil fumigant. Fumigants are a group of pesticides used to kill life in the soil prior to planting. They are frequently linked to accidental mass poisonings. These compounds are typically highly volatile and often drift off agricultural fields. Chloropicrin was awarded with a “Toxic Air Contaminant” by California in 2011 for being as carcinogenic as diesel exhaust. Even as younger non-chemical fumigants fight for a piece of stardom, Chloropicrin stands solid because his bad boy charm keeps him in the headline. Chloropicrin and his posse of bad actor soil fumigants travel from field to field leaving soil lifeless and with serious fertility issues. They drift off fields making people sick. Chloropicrin and his posse of bad actor soil fumigants travel from field to field leaving soil lifeless and with serious fertility issues. They drift off fields making people sick. A thorough review shows Chloropicrin’s performances to be truly penetrating – he finds his way into the human body both through inhalation, ingestion, and your skin. His ability to penetrate the skin made him a powerful and heroic chemical war agent. We’re looking at you workers and bystanders! A review of exposure by California’s Department of Pesticide Regulation show that there is a risk of hazardous exposure for those near agricultural field where Chloropicrin is applied. How can you tell someone has seen Chloropicrin in action? Exposure to chloropicrin causes tearing and vomiting. Chloropicrin and his bad actor posse are not the only players out there. Economically viable non-chemical fumigant alternatives are available and already in use by organic and other sustainable agricultural practitioners. These alternatives include use of resistant cultivars, cultural methods such as crop rotation and use of cover crops as well as physical methods such as soil solarization. Why do the nice guys always finish last? The Toxies: Exposed is the 4th annual project of The Toxies, a multi-media campaign created by the statewide coalition, Californians for a Healthy and Green Economy (CHANGE) and led by Physicians for Social Responsibility-Los Angeles (PSR-LA). Through popular education, our goal is to keep communities safe from toxic chemicals and pollutants.